After its "capture" in Fairmount Park, the Jersey Devil was put on display at this museum of curiosities whose publicist was considered the promoter — if not the mastermind — of the hoax that filled newspaper pages for a week in 1909. One hundred and ten years ago this month, the Philadelphia region was gripped by fear of a monster that roamed around killing chickens and pets and terrorizing residents, with armed men sent into the woods to hunt for it. That is, if the newspapers of the period are to be believed. The creature had many different names in the papers — Wozzle Bug and Jobberwock among them — but Jersey Devil was the moniker that stuck. That handle came in large part from a former Philadelphia newspaperman turned vaudeville publicist named Norman Jeffries, the prime suspect in a case of fake news that went viral long before the internet existed and social media became a favorite tool of hoaxers. It seemingly started on Jan. 16, 1909, with reports of strange hoofprints in the snow and, it was claimed, on rooftops in South Jersey. Soon, newspapers were reporting pets and chickens being killed, and sightings of a strange creature. So-called witnesses provided varied descriptions. It had four legs and could walk on two. It was winged and had the body of a kangaroo or a large opossum. Its head was like that of a horse or a collie. Its eyes blazed. It breathed fire. The Philadelphia Zoo reportedly offered a $10,000 reward for the capture of the creature — if it indeed existed. The Philadelphia Evening Bulletin published this artist's rendering of the Jersey Devil based on so-called witness descriptions. Two things should be kept in mind when reading the old stories about the Devil. First is that journalistic standards in those days were, to say the least, loose, and newspapermen often did favors that were reciprocated with free meals or theater tickets or bottles of booze at Christmas. Second is that in the face of fierce competition, newspapers would seek to match stories in rival publications at any cost — even if the price was the truth. With newspapers carrying stories of witnesses seeing the creature on both sides of the Delaware River from Trenton to the Delaware Bay, the fight was on. Somewhere in the mix was Norman Jeffries filing reports to willing recipients. The front page story Jersey Devil story from the Jan. 21, 2019, edition of the Inquirer. "Hooflike tracks" could be seen in the snow "in practically every block in Burlington city" creating a “state bordering on panic," the story said. “Hounds put on the trail refused to follow the tracks, and, with bristling hair and the picture of terror, ran home,” the article said. Stories from different newspapers, including the Inquirer, all similarly noted that older South Jersey residents were invoking the legend of the Leeds Devil to explain the strange events. The Leeds Devil was reportedly the 13th child of a Mother Leeds who lived in the Pine Barrens in the 18th century. According to the legend, when Mother Leeds cursed the child’s birth, he flew up the chimney to haunt the Pinelands for years to come. In one version, the Leeds Devil killed the midwife before flying away. On Jan. 22, 1909, thanks most likely to Jeffries, the Inquirer ran a story that offered a possible explanation to the mystery. “VAMPIRE MISSING; LOOK OUT, JERSEY,” a headline on Page Two shouted. “Australian Wonder, Cross Between a Kangaroo and Bat, Strangely Disappears,” the subhead noted. From where it disappeared and when, the story did not say, but it did recount a series of supposed encounters with the creature around South Jersey. That very day, a hunting party “captured” the creature in Fairmount Park, the Inquirer reported Jan. 23. It was, the story said, a cross between “a kangaroo and an Australian water bird” and called a “kangowing,” a made-up name for a nonexistent creature. 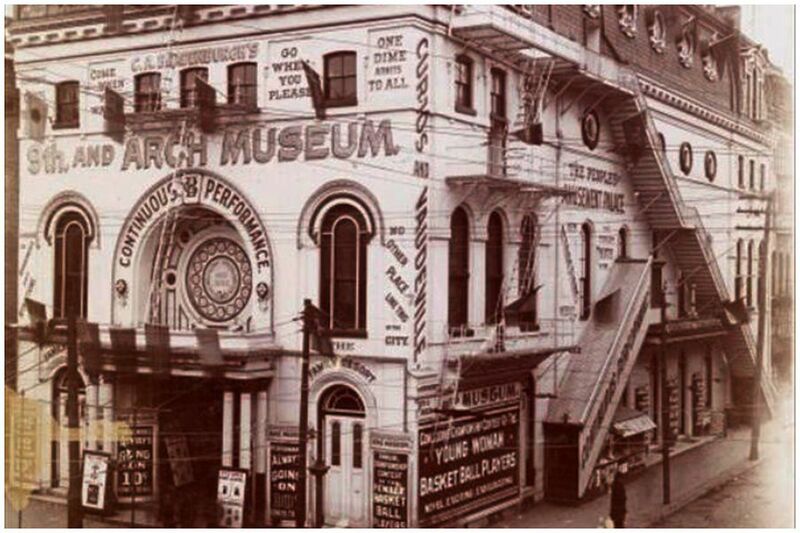 On Jan. 24, an ad for the struggling Dime Museum at Ninth and Arch Streets, which Jeffries had represented for years, appeared in the paper announcing that the captured Leeds Devil would be on display. After the creature was reportedly captured in "the wilds of Fairmount Park," ads invited the public to see the "Leeds Devil" at a museum at 9th and Arch Streets in Philadelphia. A follow-up story that could have been written by Jeffries himself reported that “thousands” had turned out to see the “fuming and fretting” creature chained in a cage. Some newspapers, however, were not buying it, and instead reported that the Leeds Devil was killed when its tail hit the electrified third rail of a train line in Gloucester County, disappearing in an explosion that left behind only a large patch of melted snow. Years later, Jeffries, whose name also appears as Jefferies in newspaper clips, confessed to staging the stunt. There have reported sightings of the Jersey Devil since then, but nothing on the scale of that week in the winter of 1909. That is, if the newspapers of the day are to be believed.